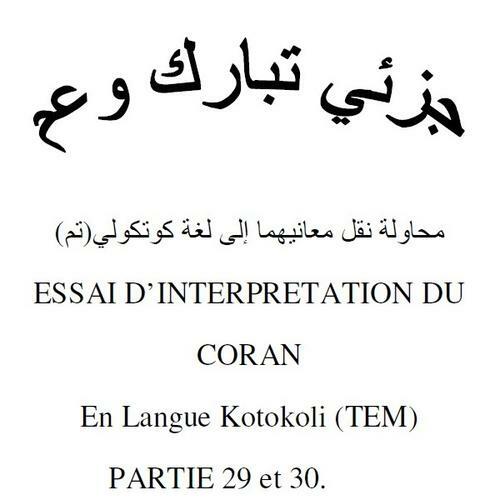 Read some portions of the Koran translated into Tem by Alfa Bashir KORODOW from Sokode. Links here are to documents stored on other sites. See below to download the complete documents. The first text was translated in 2005 from Surat 30 (Juz Amma). It includes images of the original text in Arabic and Tem translations in Ajami script (that looks like Arabic but with a lot more vowel marks). The second translation includes both Surat 29 and 30 (Jusey Tabarak wa Amma). In this booklet the Arabic and Tem are in parallel columns, and the Tem translation is in Roman script (which uses letters that resemble English). Both of these are translations made by Alfa Bashir, and used with his permission by the Tem Language Committee (CLTem).